While the advantage may be slight, Pepsi is the clear winner. NEW YORK (TheStreet) -- What is the price of security? In some instances, it is worth a great deal more than promises of higher returns. What I have come to realize is that often on Wall Street, "security" is often the most compelling reason for investors to enter a position on a stock. 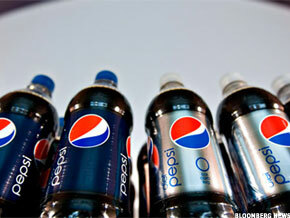 Such is the case for global beverage and food giants Coca-Cola (KO - Get Report) and PepsiCo (PEP - Get Report). While these two titans have battled it out in the market for years with their legendary "taste test," they both have been safe stocks by virtue of their stability, and they both continue to offer respectable dividends. However, on the heels of both companies having released their earnings results, the "value test" was again in session. Based on my preliminary samples, Pepsi was the clear favorite in terms of the better stock to buy. Let's first take a look at Coca-Cola. First, the company reported results that were solid -- these were the numbers that we have come to expect. The company reported net income of $2.05 billion, or 89 cents per share -- representing an 8% increase above the 82 cents it reported a year ago. First-quarter revenue increased 6% to $11.14 billion -- topping the $10.82 billion it logged in the same period last year. Clearly, Coca-Cola demonstrated both exceptional revenue growth as well as an increase of 5% in volume that was very impressive. Contributing to that growth was the company's aggressive expansion throughout various geographic regions. International volume was logged at 6% while North America grew by 2%. As much as the company showed the world loves the Coke formula, it didn't do so well when it came to profitability. Not only did its gross margin fall by 1.5%, but even more disappointing was its adjusted performance. While operating income growth registered impressively at 10%, the number was in fact closer to 2% when factoring other metrics. As for PepsiCo, the company did not report better numbers that Coca-Cola -- in fact, it can be argued that Pepsi disappointed with sales and profit numbers that registered (at best) feeble. Be that as it may, growth trends for the coming 24 to 36 months as well as its current valuation makes this a compelling bargain over Coca-Cola. For the period ending in March, though Pepsi posted a slight dip in Q1 profits, it did beat Street estimates on both revenue and earnings per share. As with Coca-Cola, the downside of the report was with the company's gross margins which arrived at 52.6% or 210 basis points worse on an annual basis. Operating margin arrived at 13.9% and 130 basis points worse than last year. Although margins disappointed, the company reported revenue of $12.43 billion -- topping consensus estimates of $12.39 billion. Sales arrive 4.1% higher than prior-year quarter's $11.94 billion. As both companies demonstrate similar strengths and challenges, the difference comes from their respective growth prospects or, more appropriately, which one is better positioned to capture and maintain what is left of the market. For PepsiCo, analysts expect the balance of 2012 to generate total sales of $67.5 billion and earnings of $4.11 per share, or 2.4% growth. It gets even more interesting for 2013 where that number is projected to top $70 billion with sales growth of 4.5% on earnings of $4.44 per share. From the standpoint of valuation that places PepsiCo at forward trading multiples of 16 for this year and just under 15 for 2013 based upon its current valuation. Coca-Cola currently trades at a price-to-earnings ratio of 20 and its growth projections places its forward P/E at just under 18. So, based on the recently reported Q1 earnings of both companies, they experiencing similar challenges and, remarkably, they are both growing at the same pace. Does Coca-Cola deserve the higher trading multiple? It depends where investors place values such as security. PepsiCo clearly demonstrated that it is equally as secure and to top it off, its 3.1% dividend yields is higher than what Coca-Cola pays out in 2.7%. The numbers clearly demonstrate how tight the race is between these two rivals. When the investments options are this close, why not choose the one that presents an advantage, however slight? In this case it is clearly Pepsi over the long term. Interestingly, I am part of the small minority that could never tell the difference between the two in taste tests, but in the stock market, where value matters, the test suggests that Pepsi is the right choice while Coke just might be a tad overvalued. At the time of publication, the author was long held no positions in any of the stocks mentioned, although positions may change at any time.